A strong low has just come off of the coast of Africa. It looks like a depression already. Plenty of time to watch this one. NHC finally called this feature a tropical depression at 5 am edt. It certanly was a t.d. yesterday, per the Quickscat and presentation of satellite. 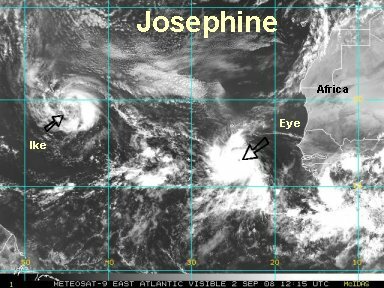 Today on the visible imagery, it looks like Josephine has an eye. If this is an eye it's probably up to 80 mph already. Josephine should move generally west or west-northwest for awhile. 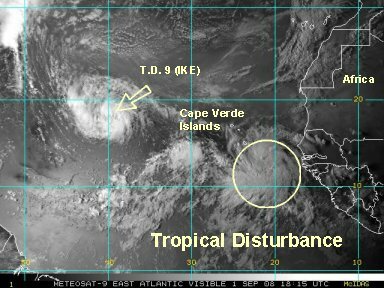 It's south of the Cape Verde Islands and a very long way from the Caribbean still. Josephine still looks very well organized. The cloud feature we talked about earlier today looked like an eye feature. Without high res satellite imagery we can't be dogmatic about it. The eye-like feature has filled with cloud, but is still very apparent on the imagery. NHC took a pass by saying without any nearby wind observations, it looks well organized so well call it 50 mph. They bring it up to hurricane strength by 24 hours. It should move to the west, then west-northwest. Still lots of time to watch it. 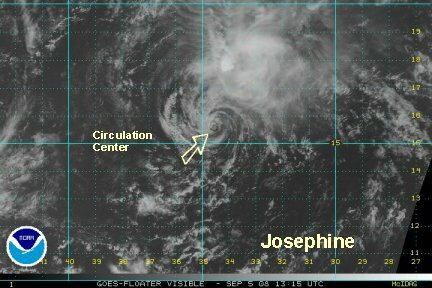 Josephine is now being sheared by a trough dropping southward, north of it. It has weakened and looks to be a minimal tropical storm at this time. In fact, it looked its strongest just before it was offically classified. 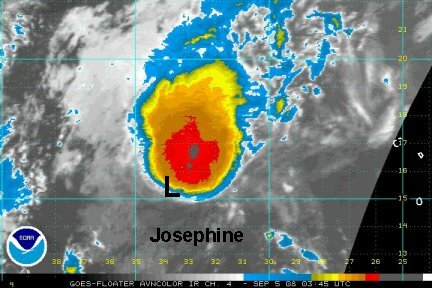 Josephine will likely regain strength after the trough and its shearing winds pass by. As mentioned before, its a long ways out. Nothing much new to report here. 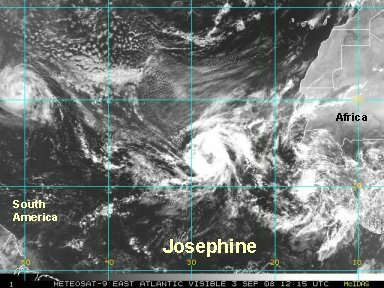 Josephine is holding on to tropical storm strength. As we mentioned last night, it is still a long ways out. There's a chance it will try to strengthen some as it moves away from the trough. Josephine is fighting wind shear. It appears to be weakening some. NHC has 60 mph. This may be a bit high, but should be close. The models keep Josephine into the open Atlantic. Last edited by Caribbean Traveler on Thu Sep 04, 2008 12:51 am, edited 1 time in total. 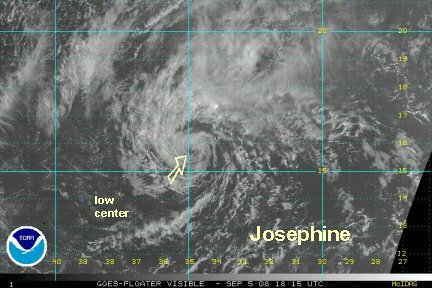 Josephine is hanging on despite battling wind shear from a nearby trough. It stll is not very impressive on the satellite imagery. It had weakened considerably by the last NHC advisory time, and they took it down to 50 mph. Even though some convection is rebuilding, 50 mph is still probably a good estimate. 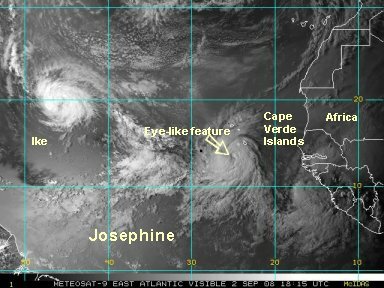 Josephine will likely stay north of the Islands several days down the road. Wind shear has now stripped the convection totally away from the circulation center. Deep convection has been removed to the northeast of the circulation. We don't agree with the top winds at 50 mph. There may be some gusts 40-50 mph in the convection well northeast. It is barely hanging on as a tropical cyclone. NHC makes it an extratropical cyclone several days out. Southerly wind shear is still greatly affecting Josephine, although deep convection recently has made a resurgence on the northeast sector. The upper trough is very strong to its west and the question is whether Josephine can survive the shearing winds before possibly getting into a more favorable flow. It will still be in the open waters of the Atlantic. Last edited by Caribbean Traveler on Fri Sep 05, 2008 10:04 am, edited 3 times in total. 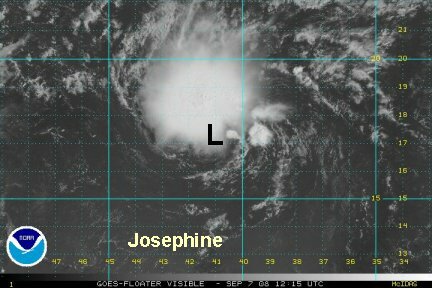 Southerly wind shear continues to menace Josephine. NHC just took Hanna from 50 mph to 45. It probably isn't a t.s. anymore. Our guess is that winds are 35 mph. We'll keep and eye on it in case it tries to make a comeback in a few days after it moves away from the upper trough some. 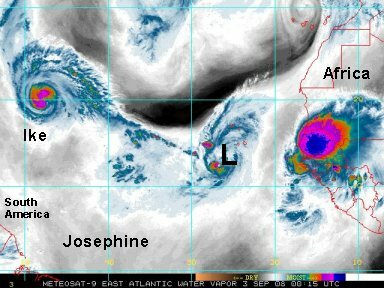 Josephine has no convection near its center, and only a little north of it. It does not appear to be a tropical storm and should be downgraded. Our estimate is 35 mph. 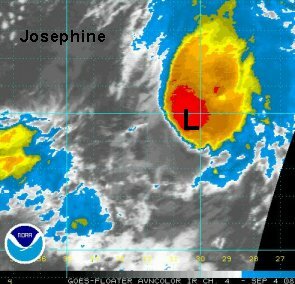 NHC had Josephine at 45 mph on the 11 am ast advisory. Officially its 45 mph. Next official advisory from NHC will be 5 pm edt. 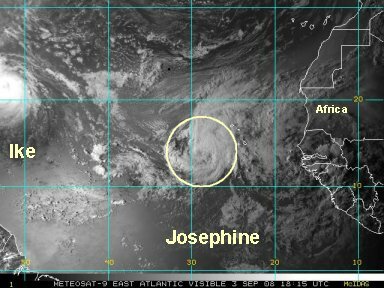 NHC has now joined us and is calling Josephine a depression. This will be the last advisory, unless regeneration occurs. 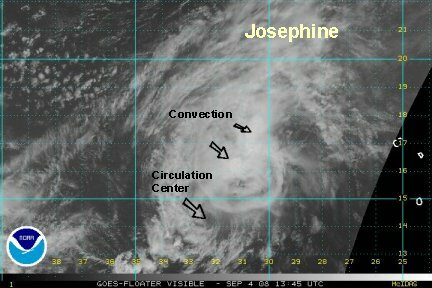 Josephine is gaining convection again. It has convection on the north side of the circulation, but is still being sheared. We'll keep an eye on it. The southerly wind shear is pushiing the convection north again. Josephine's attempt at regeneration has failed this time.